Easy Cake Mix Crinkle Cookies – this easy recipe combines cake mix cookies with an easy crinkle cookie recipe! No one will guess they’re from a cake mix, and you can use any flavor cake mix you want! Easy cookies for a busy season – that’s the perfect recipe, don’t you think? My little dear sweet Abby is in full puppy mode at this point. She is high energy and can be pretty destructive if I don’t walk her enough or pay close enough attention. It’s kind of like when your kid is quiet for a long period of time and then you realize she’s drawn all over the walls with sharpie. With a puppy, when you get some peace and quiet she’s ripping apart a piece of black construction paper so it looks like a bomb went off in your office. Or it’s that she’s chewing through a charging cord. It’s really a good thing she’s cute and gives me kisses. These days it seems like my time is super thin, between working and walking Abby and exercising and being a parent…there’s not a lot of extra time this year. I’m trying to create shortcuts wherever I can, especially because I really want to enjoy the holidays this year. 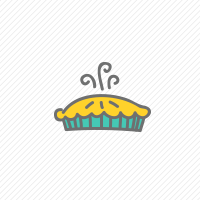 For example, I didn’t even post a new pie for Thanksgiving. I posted turkey and mashed potatoes and gravy, but no pie. I was trying to think of one I could quick throw together but I realized that was just not happening, especially since these cookies have sat in my drafts forever. Plus, I have tons of pie recipes to choose from if you’re looking (apple, pecan, and pumpkin are popular this time of year). So, cookies it is today! 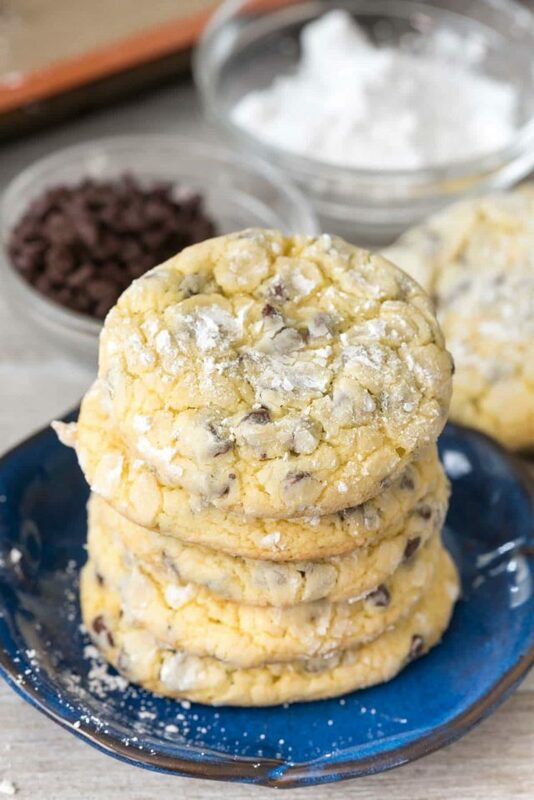 Cake mix cookies are some of my favorite ones because they’re so easy. These Cake Mix Crinkles are even better because they’re a little fancier (perfect for Christmas) and no one will know they’re from a cake mix! I always love crinkle cookies at Christmas. They seem so festive, kind of like snowball cookies. We used to make chocolate crinkle cookies when I was a kid and I remember loving them. Now, I know cookies aren’t hard to make, but sometimes you have a cake mix and you just want to use it. Or you don’t feel like measuring sugar and flour. Or maybe you just love the cake mix flavor (that would be me). Whatever your reason for making cake mix cookies, these are a great go-to recipe for any occasion. Another reason I love cake mix crinkle cookies so much is because you can use ANY flavor cake mix. Lemon, chocolate, yellow, strawberry: you name it you can use it. That makes it SO easy to make a ton of different flavor cookies for your holiday platters without all the work and extra ingredients. Easy holiday = winning in my book. I need easy this year. 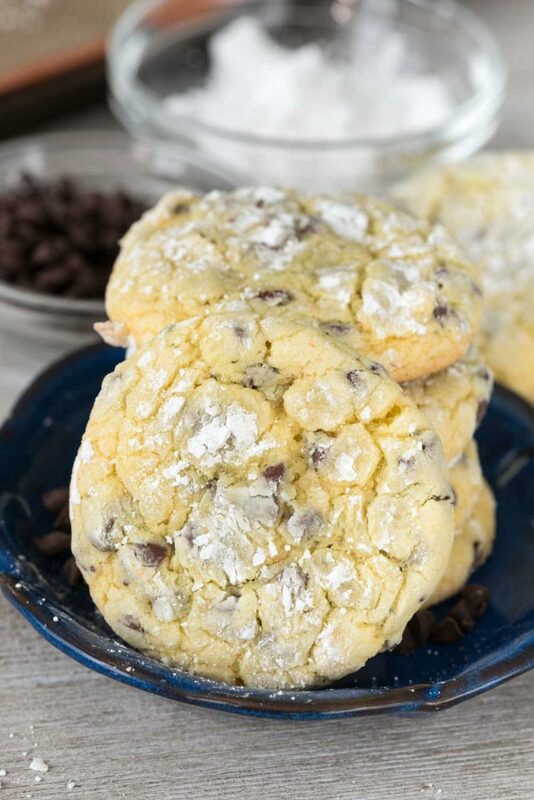 Cake Mix Crinkle Cookies are easy to make with any flavor cake mix! Basically, follow my simple recipe for the perfect cake mix cookies and add your own flavor twists! Which cake mix flavor will you use? Choose your cake mix flavor. Use whatever flavor you like, or pick a few! I love using vegetable oil in my cake mix cookies. This keeps them tender, but you can also use the same amount of melted unsalted butter. I prefer liquid fat to solid butter because the end product tastes better, IMO. Use your favorite mix-ins (optional). I used chocolate chips in these crinkle cookies but you could leave them out. Or, add mint chip pieces or M&Ms or chopped candy. The dough is sticky, so if it’s too soft, chill it for 30 minutes before baking. I like to roll these in powdered sugar before baking – that’s what makes them crinkly! Easy Cake Mix Crinkle Cookies - this easy recipe combines cake mix cookies with an easy crinkle cookie recipe! No one will guess they're from a cake mix. Preheat oven to 350°F. Line two cookie sheets with silat baking mats. Mix cake mix, oil, and eggs with a hand or a stand mixer until a sticky dough forms. Stir in chocolate chips. If dough is too wet to handle, chill for 30 minutes. Place about 1/2 cup powdered sugar in a small bowl. Scoop 2 tablespoon sized balls of dough and coat them with powdered sugar. Place on cookie sheets. Bake immediately (or powdered sugar will dissolve) for about 10-12 minutes. Cool at least 5 minutes before removing from cookie sheets. If you love cake mix cookies, be sure to check out Taste and Tell’s cake mix cookie video, Oreo Cake Mix Cookies, Strawberry Funfetti Cake Mix Cookies, or my favorites Cake Mix Sugar Cookies, Lemon Funfetti Cookies, or Peppermint Gooey Bars. I made these with Butter Golden cake mix. It was a very unappealing shade of yellow, so I added blue food coloring. My 14 year old son could not get enough of them! He especially loved the ‘crinkle’ part!! I’m making this recipe again tonight, with Butter Pecan flavor cake mix. Yum!! I made these cake mix cookies in many different flavors using many different additives at a Christmas baking party the 2018 season. They were a huge success !! I will definitely continue to use this process. I made several batches today for my brother up in St.louis, Mo. I’ll be mailing them on Saturday. I know he’s going to love them !